The Isle of Man is located between Ireland and Great Britain in the Irish Sea. The island is a British Crown dependency that officially recognizes Queen Elizabeth II as its sovereign. Despite being a British dependency, the Isle of Man has achieved a global reputation for producing its own coins and stamps, including the Platinum Noble. The coins were actually produced by the Pobjoy Mint, a private British mint that was started by the Pobjoy family. The Isle of Man Platinum Noble was the world’s first platinum coin, first produced in 1983. Production was discontinued in 1989, so it only had a six-year run. Sometimes the coin is also called a Manx, which is also what the population and the language of the Isle of Man are referred to. While the coin was minted in ten different weight denominations, only five – 1 oz, ½ oz, ¼ oz, 1/10 oz, and 1/20 oz – were issued in significant numbers. The obverse of this coin bears the profile of Queen Elizabeth II. Unlike other so-called “Empire” coins, the Platinum noble features a young Queen. To the left of the profile, it reads ISLE OF MAN while it says QUEEN ELIZABETH II to the right. The date is found at the bottom, below the profile. The reverse displays a Viking ship that is sailing in the sea with seabirds flying on either side of the mast. Below the waves from the ship, it says “1 OZ PLATINUM FINE” and “ONE NOBLE.” Furthermore, the rim is embellished by a Viking Knit with a triskelion formed from legs right above the ship’s mast. The triskelion is also found on the Isle of Man flag. The inspiration for the Manx Platinum Noble comes from coins used in England in medieval times. For example, during the reign of Richard II, a gold noble was the most valuable coin in England and possibly also all of Europe. In those days, the historical gold coin was worth six shillings and eight pence. 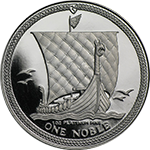 The design of those medieval gold nobles feature a king standing in a ship, similar to the style of the Isle of Man Platinum Noble. These coins are all made of fine platinum and are 99.95 percent pure. Despite its unusual currency, the Platinum Noble is legal tender on the Isle of Man. The actual currency used in circulation in the British Crown dependency is Manx pounds and pence, which are equivalent to British pounds and pence. Moreover, the coins are being produced to the standards of the Royal Mint. While Manx Platinum Noble coins have the face value of one noble, their worth is mostly measured by their precious metal content as well as collectable value. Isle of Man Platinum Nobles are sought after in the numismatic world due to their platinum content, unusual currency, unique design, and low population. As a matter of fact, the Pobjoy Mint is known for its innovative and distinctive coins that have won multiple awards over the past decades. The Platinum Noble was designed for investment purposes as platinum is much more scarce than gold or silver. These platinum coins are also eligible for a self-directed IRA, which helps investors diversify their portfolio and protect their assets from market fluctuations.